» The Great Carpet Cleaning Debate: DIY or Go With a Professional? The Great Carpet Cleaning Debate: DIY or Go With a Professional? Carpets have adorned homes and offices for decades, providing warmth, comfort and an added touch of personal style. Even after all this time, the great debate continues about the most effective way to get the deep clean that carpets need to maintain longevity and appeal. Some people feel that renting a machine and going with the DIY approach is sufficient enough, while others steadfastly believe in calling a professional to get the job done. Though it’s understandable that homeowners and business owners want to do whatever they can to save a few dollars here and there, here are a few reasons why carpet cleaning may not be the best expense to cut down on. Professional: There are many different styles of carpets, and they won’t necessarily all benefit from one particular cleaning method. 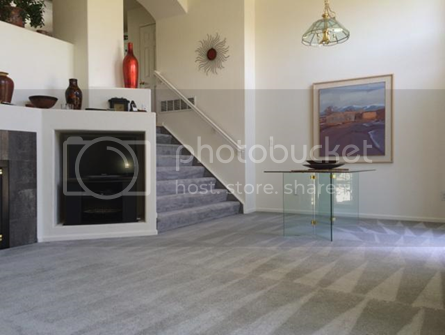 Carpet cleaners are trained to assess the type of carpet you have and – taking the manufacturer’s recommendations into consideration – figure out the right cleaning technique for your specific kind of carpet fibers and pile. In addition, they have the appropriate cleaning solutions and equipment and know how to use them properly. DIY: Lack of knowledge when you try to clean your own carpets can leave you with damaged carpet and/or a voided warranty. If you don’t know how to correctly use a rented machine, you may find yourself with an even bigger mess because water and cleaning solution can leak out and end up leaving stains on your carpet. Plus, maneuvering a heavy carpet cleaning machine around each room can be pretty tricky. Professional: Some homeowners may think they’re saving time by cleaning their own carpets, however, experienced carpet cleaners are much more efficient and can generally get in and out a lot quicker than you would think, providing a thorough job in the process. Just as important as the cleaning itself is the drying. Professionals have powerful drying equipment that won’t leave you with wet carpet for days. DIY: It would be very difficult to achieve the same results as a professional carpet cleaner since the quality of equipment is much less superior. People who go the DIY route generally find that they aren’t able to break up and extract all the soil, dust, allergens and pollutants that embedded in the carpet. Oftentimes, even if it looks like a job well done at first, people mistakenly leave residue behind, which just works to attract more dirt in a short timeframe. This negates all the hard work you just did and leaves you with dirty carpets once again. Professional: It’s entirely possible to find a reliable, trustworthy carpet cleaning company that isn’t out to break your bank. Many companies offer coupons as well. Hiring a professional who is insured and has a satisfaction guaranteed policy will give you peace of mind that if anything should go wrong, you won’t be left with another bill. DIY: Usually, the whole reason people decide to clean the carpets themselves is to save money, but when you add up the costs of renting the machine, buying the solution and any other cleaning products that might be required, you could end up spending nearly as much. It’s also important to keep in mind the expense of repairing any potential damages that could occur in the process. There are many advantages to going with a professional carpet cleaning instead of trying to handle it on your own. Not only will all the hard work be done for you, but you’ll also get to enjoy fresh carpets that have been truly deep cleaned. this article? I’d realy like to be a part of online community where I can get opinions from other experienced individuals that share the same interest. in his/her brain that how a user can know it. Therefore that’s wwhy this article is outstdanding. May I just say what a comfort to find someone whho genuinely knows what they’re talking about on the web. story. I can’t believe you aren’t more popular since you definitely hhave the gift.